Tyler’s landscaping job develops his muscles, but also allows him to use his skills at digging holes: “I was good at digging holes. It was the rest of life I sucked at” (p. 39). What figurative holes has Tyler dug for himself in his life? Is it really true that he isn’t good at anything else? Although he doesn’t seem like a depressed person, Tyler admits to being preoccupied with death. “Thinking about death relaxed me” (p. 44). Why? In what ways has he died and been reborn again throughout the story? At Tyler’s high school there is a clear distinction between the popular crowd and everyone else. Where do you fit in the social scale at your school? In what ways has the status you hold in your social sphere defined you? In what ways is this role true to who you are? In what ways is it not? Why does Tyler like Bethany? Were there any signs early on that she might not really like him the same way he liked her? What do you think is her real attraction to him? Is it true when his sister Hannah says that it could never have worked out? In your own life, are there any examples of two very different people who manage to be together despite their apparent differences? What do you think of Tyler’s reaction to Bethany’s behavior at the party? How would you react? Would you be sad? Angry? 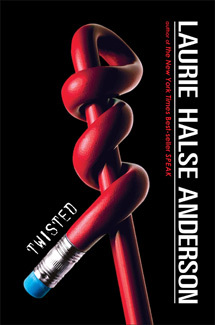 Why do you think Laurie Halse Anderson chose “Twisted” as the title of this novel? What does it mean in relation to the story? On the surface Tyler seems to disrespect the janitors that he is made to work with as part of his probation. Yet they act as a sort of conscience and offer support later in the story. Have you ever gotten help from an unexpected source? Who has Tyler been trying to be? His father? A loser? A cool guy? Which of these identities is closest to his true self? Laurie Halse Anderson views Tyler Miller as the literary grandson of Willy Loman, the main character in Arthur Miller’s play, Death of a Salesmen. What parallels are there between the two stories? What do you think will happen to the characters in this story in the next year?